For our Coney Island Tour we teamed up with Sligo Boat Charters to bring you an unforgettable experience on the Sligo coast. A Coney Island water taxi service is available on board the “Dalemoor”. The Dalemoor is the smaller of the two charter vessels, or the “M.V. Sarah Marie” (according to group size) for the naturalists, campers, hillwalkers, bird watchers, cyclists and secluded beach goers who would like to visit the island. 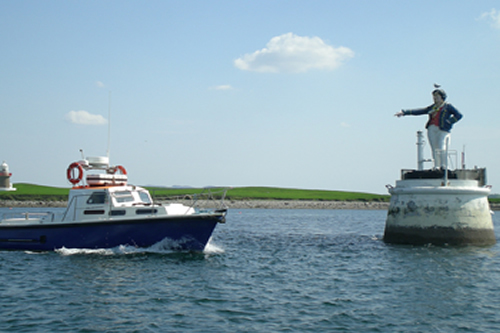 Departing from Rosses Point, just 10 minutes from Sligo town this trip to the picturesque island of Coney is perfect for those who want their activity to suit their time. The island is only a 5 minute journey away, and boats over and back can be booked to suit the times of the group. A favourite activity here is to visit the local pub, take a picnic/bbq, take the scenic walk with views of Blackrock lighthouse around the North side of the island (try to count the rabbits! ), explore the famine structures, try to find “St Patricks Wishing Chair”, or the remains of the washed up whale, or, for the more adventurous, take a dip in the secluded beach to the rear of the island. This trip can also be done in conjunction with a sightseeing/ seal watching or fishing trip to top off the evening and maps are provided! The island is approximately 400 acres and is so named because of the vast quantity of rabbits which can be spotted on the island at any time. In 1862 the island had a population of 124 people, with 45 children attending the local school. The island now has only one family of permanent inhabitants (traceable there back until the 1750s) but houses many other temporary residents, especially in the summer months. Most visitors like to frequent the local pub, spot the faerie, ring and napoleopic star-shaped forts, visit Carty’s strand (the secluded beach to the rear of the island), walk around the island to spot rabbits or the schoolhouse and other famine structures which remain, or just to relax there for a barbeque and a swim. There are also stories of faeries, mermaids and spirits here, and visitors can try to find the elusive “St Patricks wishing chair, St Patrick’s Well, the remains of a washed up whale and some fairy forts in this very relaxing retreat.